Are you an Apple or an Android fan? 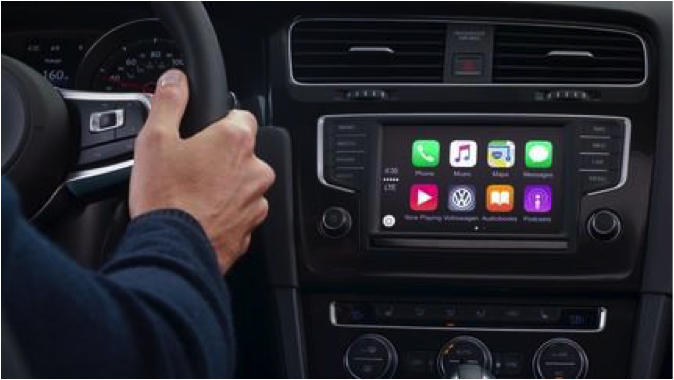 If you purchase a 2016 Volkswagen, your preference won’t matter, thanks to the MIB II infotainment system and its ‘App-Connect’ smartphone integration.. The App-Connect system integrates Apple CarPlay, Android Auto, and MirrorLink into one platform, allowing users to sync any of their phones regardless of what operating system that phone is built upon. This is big news to the auto industry because VW is the only manufacturer to include a system that works with three other systems. Drivers no longer have to worry about whether or not their phone will sync with the car they just purchased. So buy whichever phone suits your needs. Like any other infotainment system, this includes hands-free calls, texts, navigation, and more. These new systems act more like smartphones than the clunky older generation infotainment systems. Drivers can focus more on the road without being distracted by looking down at their phones. What’s great about the MIB II and App-Connect is that it will be available on 75% of the 2016 Volkswagens, giving consumers more choices to choose from than just the luxury models.